This Stratford Perth Museum’s role in telling the history of Perth County has gone outdoors. The series of trails at the back of the property is now home to an historical walk. 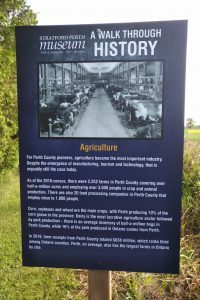 There is a trail head sign which signals the start of the .7 kilometre paths and then 15 story boards that chronologically tell the colourful history of Stratford, Perth County and the surrounding area. The historic walk brings to fruition the vision of the museum and its site plan committee that was several years in development and fulfills an element of the the museum’s strategic plan. The historic trail begins with a plaque about the ice age, then the first inhabitants of the area, followed by the European settlers who arrived in the 1830s and progresses through the next almost 200 years up to the current day. Other topics include the arrival of rail and the impact on county industries, the participation in both World Wars, the major economic sectors including agriculture, manufacturing and tourism and a current snapshot of the city and county. The trails are free to roam and are open 24 hours a day, 365 days a year. The official name of the trail system is the Tom Orr Memorial Perth County Historical Walk. Orr, a tireless civic leader and a great supporter of the museum and archives, died earlier this year. The property at the back of the museum and archives demonstrates the museum’s commitment to a holistic and natural environment that will appeal to adults, families and school groups. The area not only includes the trail system but also a stormwater pond and the area is also home to bee hives which produce honey for our gift shop. Upper Thames River Conversation Authority, Stratford Perth Community Foundation, TD Friends of the Environment, Ontario Power Generation, A Touch of Dutch Landscaping, Ed’s Concrete, Permacon and the County of Perth.